Product Description: Certain things remain constant, like the love of cookie dough – as in raw cookie dough. 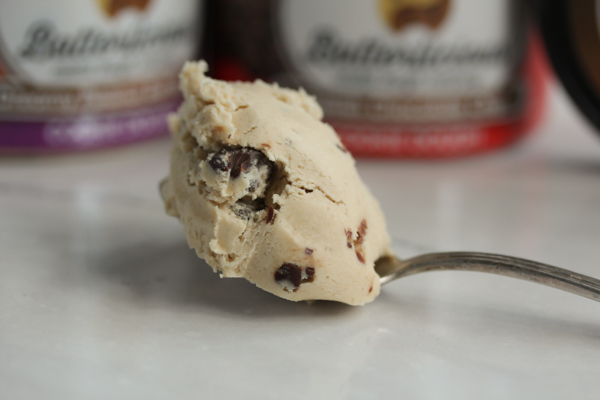 We see “cookie dough” used as a flavor in ice cream, candies and other sweets and then there is the cookie dough itself. But as you all know by now, eating classic cookie dough in its raw form is not recommended due to the presence of raw egg. 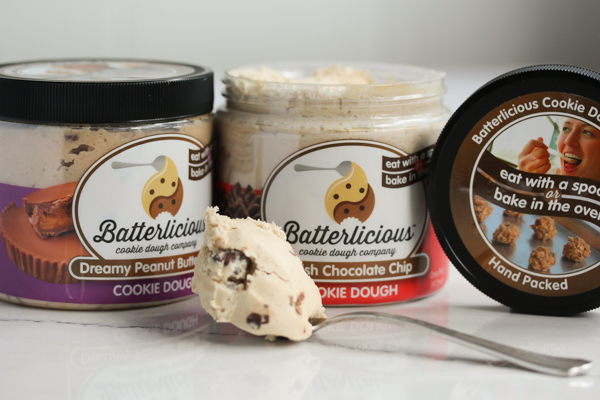 Batterlicious has solved this by creating a suite of flavors that are not only eggless, but formulated to be enjoyed raw or baked. We have reviewed raw cookie dough products before, but this is the first one we know of that is marketed as being a raw from-the-jar product as well as one that can be baked, giving us the best of both worlds. Company description: “Our edible, bakeable, and irresistible cookie dough is a way for our family to share our tradition with every other family, minus the mess or tummy ache and adding even more yum to every spoonful! Test Kitchen Overview: We were sent two flavors: Delish Chocolate Chip and also the Dreamy Peanut Butter Cup. The packaging is attractive as seen above in top image with an easy to open and close airtight top. 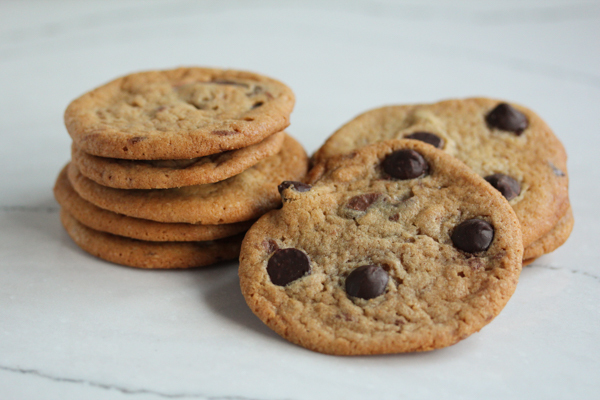 Ingredients for Delish Chocolate Chip: Wheat flour (bleached wheat flor, malted barley flour, niacin, iron, thiamin, mononitrate riboflavin, folic acid), Unsalted butter (pasteurized cream, natural flavoring), Semi-Sweet Chocolate Chips (sugar, chocolate, cocoa butter, milk fat, soy lecithin, vanillin -artificial flavor, milk), Brown Sugar (sugar, molasses), White Sugar, Spring Water, Vanilla, Sea Salt, Baking Soda. Ingredients for Dreamy Peanut Butter Cup: Wheat flour (bleached wheat flor, malted barley flour, niacin, iron, thiamin, mononitrate riboflavin, folic acid), Unsalted butter (pasteurized cream, natural flavoring), Brown Sugar (sugar, molasses), White Sugar, Peanut Butter Cups (milk chocolate (sugar, cocoa butter, chocolate, nonfat milk, milk fat, lactose, soy lecithin, PGPR an emulsifier), peanuts, sugar, dextrose, salt, TBHQ preservative, Peanut Butter (roasted peanuts, sugar 2% or less than molasses, fully hydrogenated vegetable oils – rapeseed and soybean – mono and diglycerides, salt), Spring Water, Vanilla, Sea Salt, Baking Soda. The dough was sampled raw and baked. Raw it is very similar to what we experience at home (when we cheat and eat egg-rich dough) although the texture was a bit different. It is hard to describe but it is softer and seems a bit less substantial. The soft texture, however, was a boon when it came to scooping out for baking. Even straight out of the fridge it was very easy to create nice round mounds that baked up into nice round cookies. Testers liked that they could dole out enough for one or two cookies at a time and even bake them in the toaster oven, making hot chocolate chip cookies a near instant gratification item. Pros: Knowing that we don’t have to worry about the health risks of raw egg put our minds at ease and the ability to also bake the batter was appreciated. The jars have a refrigerated shelf life of several months. Cons: We all wanted more chocolate chips and more peanut butter cup pieces in the dough, but that was easily remedied, as you can see in the image below. The cookies on the left were baked as is, out of the jar. For the ones of the right we simply sprinkled some extra chocolate chips on top of the dough before baking. Suggested Use: Great gift for the cookie dough lover.You can buy the flavors individually or they also offer a Starter Pack and a Fabulous Four Pack, which also includes their Sinfully S’mores and Amazin’ Oats & Raisin flavors. Where to Buy: Directly from Batterlicious. The 1 pint (473 ml) containers sell for $8.50. Wholesalers should inquire via phone 800-356-9091.